I found this list on a sidewalk on the north side of Chicago. I love that the titles at first seem incongruous, but there’s a definite pattern that emerges. The pattern becomes clearer when you turn it over to find a few more classics listed, including “Hamlet,” “Walden,” “The Great Gatsby” and “The Catcher in the Rye.” I’m just thankful she got at least one crossed off before she lost the list. 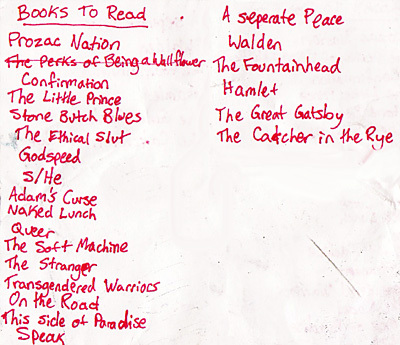 “Wallflower” was better than “The Catcher in the Rye” anyway.